On May 29, this photo was taken on the International Space Station by a NASA astronaut on Expedition 23. 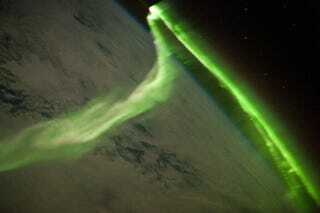 It shows aurora australis, the southern Lights, zigzagging towards the South Pole. While aurora are generally only visible close to the poles, severe magnetic storms impacting the Earth's magnetic field can shift them towards the equator. This striking aurora image was taken during a geomagnetic storm that was most likely caused by a coronal mass ejection from the Sun on May 24, 2010. The ISS was located over the Southern Indian Ocean at an altitude of 350 km, with the astronaut observer most likely looking towards Antarctica (not visible) and the South Pole. Forget Pink Floyd Fridays at the state planetarium — nature provides all the trippy laser displays you could ever ask for.